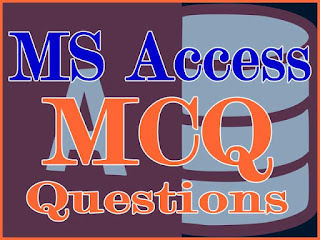 Important Database questions from DBMS Concepts and Microsoft Access (MS Access) online tests [mcq] for interviews and competitive exams. Database quiz tests are suitable for both freshers and experienced. 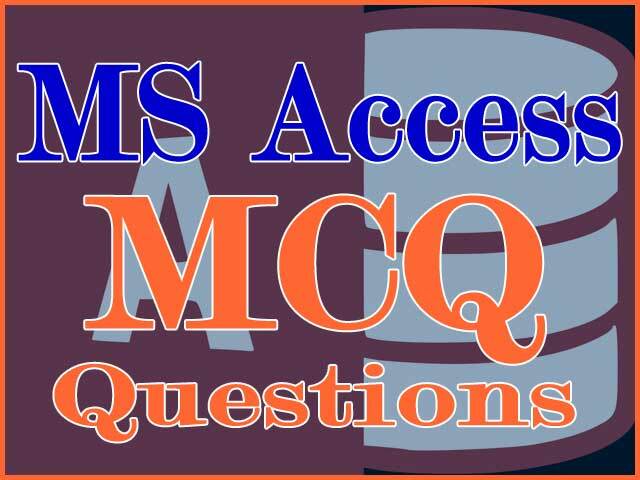 We present MS Access Database Multiple Choice MCQ Question & Answer in this post. Microsoft Access is part of Microsoft Office package. It is a desktop database management system and often candidates find this topic harder compared to other packages. However, it is easy to understand if you attempt this MS Access MCQ quiz online test. Microsoft Access (MS Access) quiz question bank in PDf format is available for download. Please check the Download menu above. 3. This data type allows alphanumeric characters and special symbols. 6. To create a new table, in which method you don’t need to specify the field type and size? 7. Which of the following is not a database object? 10. Two tables can be linked with relationship so that the data integrity can be enforced. Where can you find Relationship Command? 11. This is the stage in database design where one gathers and lists all the necessary fields for the database project. 17. The command center of access file that appears when you create or open the MS Access database file. 20. What happens when you release mouse pointer after you drop the primary key of a table into foreign key of another table? 24. After entering all fields required for a table, if you realize that the third field is not needed, how will you remove? a. You need to delete the whole tablThere is no method to remove a particular field only. 26. Which field type will you select when creating a new table if you require to enter long text in that field? 30. This option allows you to build a new table by entering data directly into the datasheet. 33. In table design view, which key can be used to switch between the field names and properties panels? 34. Which of the following is NOT a type of Microsoft Access database object? 35. Which of the field has width 8 bytes? 36. Which is not a view to display a table in Access? 37. Which of the following database object hold data? 41. Which of the following database object produces the final result to present? 44. You can set a controls border type to make the border invisible. 48. It is an association established between common fields of two tables. 50. When entering field name, how many characters you can type in maximum?